There are numerous benefits of playing games for seniors, especially for those who have dementia. In addition to being a great source of fun and easing the agitation brought on by the disease, games help keep senior brains active. The following games mentally stimulate seniors, help slow the progression of the disease, and come highly recommended by providers of home care Oshkosh families can trust. Surprisingly, video games can be useful in keeping senior brains active, even those who have dementia. While almost any game will do the trick, many companies are now marketing specific games for use by adults who need to exercise their brains. 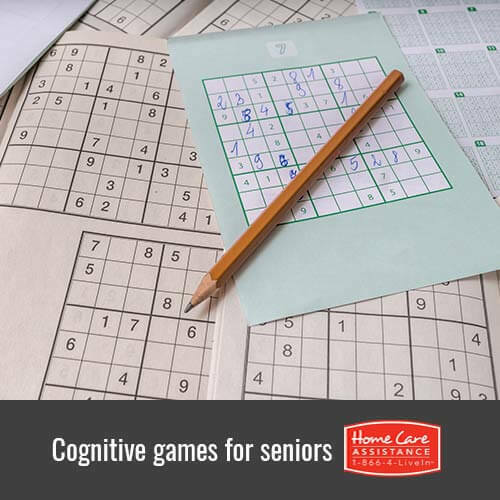 Initially, these games were geared towards adults with healthy minds, but Alzheimer’s facilities in the U.S. are finding that seniors with cognitive decline also benefit from playing these types of games. One specific computer-based game to look into is SmartBrain. The Journal of Neurology, Neurosurgery, and Psychiatry reported that the game helps with attention and memory, and can even be adjusted to meet the needs of people with varying degrees of dementia. This question-based game was designed by specialists in the gerontology field to encourage and bolster memory skills. Regardless of mental abilities, it’s a game your loved one can enjoy playing with the whole family, even the grandkids. The game gently probes your senior loved one’s memory by asking him or her to remember certain events in a way that isn’t frustrating to them. This game is great because it can be played in more than one way, making it ideal for seniors at any stage of dementia. Initially, it was designed to be a game of strategy and logic. Seniors with mild dementia can play as intended to strengthen their minds and slow the progression of the disorder by thinking logically. For seniors with more advanced dementia, Qwirkle has alternate styles of play that focus more on color matching and patterns. Stimulating senior cognition is key to caring for an aging parent or family member with dementia. In fact, mental stimulation is important for seniors with any degenerative illness such as Alzheimer’s, dementia, and Parkinson’s disease. To help your loved one exercise his or her cognitive function, turn to Home Care Assistance. As a leading provider of Alzheimer’s, stroke, dementia, and Parkinson’s care Oshkosh families can trust, we strive to stimulate senior cognition with companionship and emotional support in the familiarity of home. Give your loved one the dementia home care he or she deserves. Call us at (920) 710-2273 today to speak with a compassionate Care Manager about scheduling a free consultation.